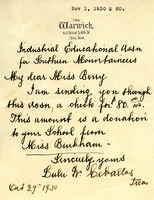 Lulu W. Ceballos sends a$80 donation made by Miss Burkham. 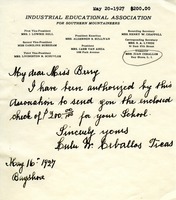 Note from Lulu W Ceballos with a gift from the Industrial Educational Association for Southern Mountaineers. 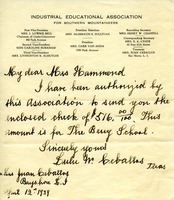 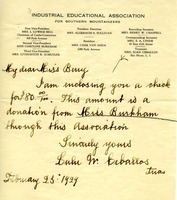 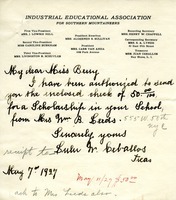 Note about a contribution from Miss Caroline Burkham through the Industrial Education Association for Southern Mountaineers. 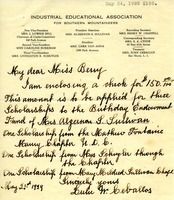 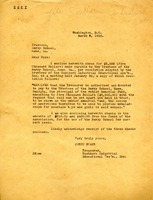 Letter enclosed a $734 check to endow November 3, birthday of Mrs. Algernon S. Sullivan, president of the Industrial Education Association for Southern Mountaineers. 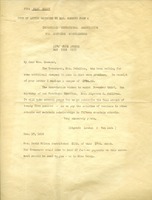 Milton discusses the Pictorial Review Award application, advising that the best approach is to get close to the judges. 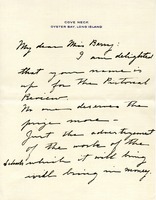 She mentions her own health problems and Jennie Berry's marriage to Enrico Ruspoli.